The requirements of the map are listed below. All the tasks required to fulfill this assignment are documented within this and previous modules. Template web page is located in lesson-map folder. Commit the changes and push the repository when you are finished. The maps and layout can be working drafts. We just want to see that you worked through the lesson before you tackle the lab. Paste URL link within the Canvas to this repo, e.g., https://github.com/newmapsplus/map671-module-05-username. Aztec Aquaponics, a small company based out of Albuquerque, specializes in using beer brewing byproducts for their aquaponic operations. The produce sustainable fish and lettuce greens that supply an artisan fast-casual national restaurant chain. They have hired you to help locate their newest operation. They need to find high-density areas of breweries to maximize their aquaponic production. Their supply chain requires that they cannot transport the brewery byproducts more than 25 km. Where should they locate? Hex binning brewery locations in North America and Hawaii offers a potential solution. 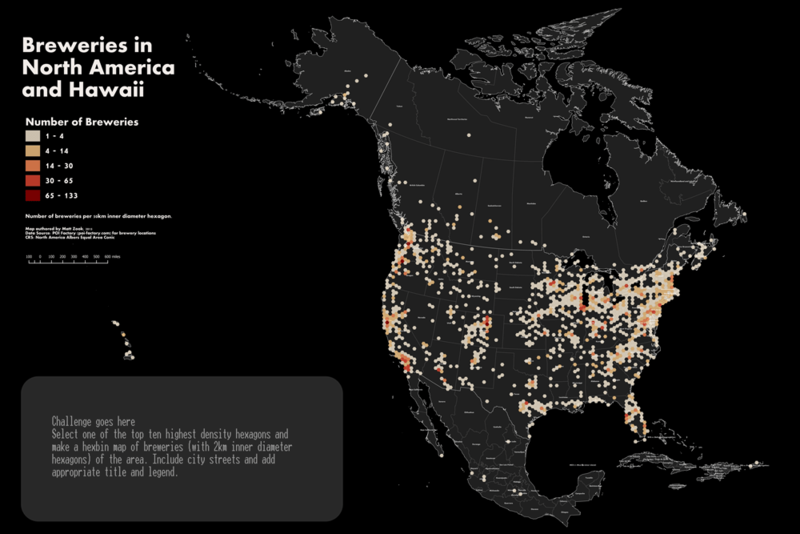 poifactory_breweries_170206 layer showing over 7,000 breweries in North America and was downloaded from The POI Factory on February 6, 2017. The map must be a hexbin map that aggregates breweries by hexagons of no more than 50 km in length for the long diagonal. The coordinate reference system of the map must be North America Albers Equal Area Conic (EPSG: 102008). 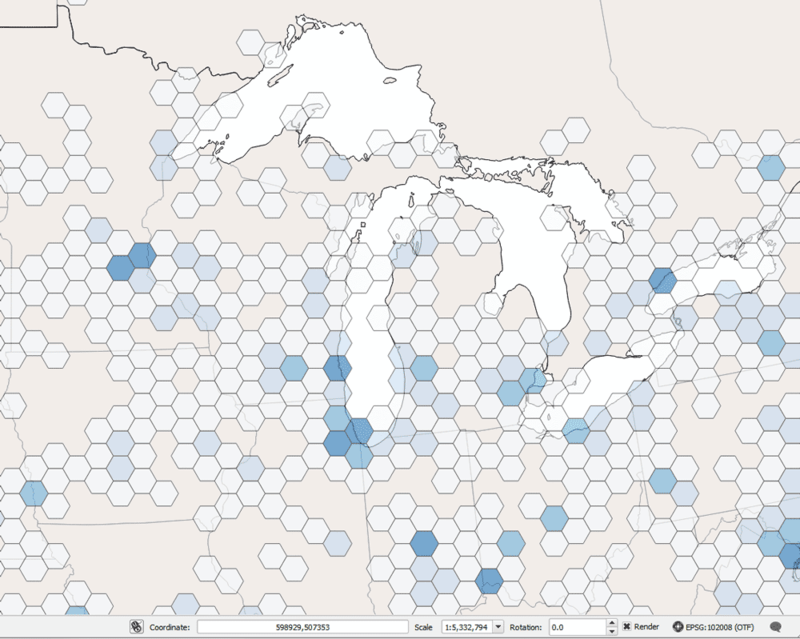 Use layer transparency and blending modes to show state and country boundary lines and the classed hexbin. A viewer should be able to identify in what state and country a hexagon exists. Hexagons with no breweries should not be symbolized. Map must have a meaningful title and appropriate legend. Map must include metadata information including the source of data and the projection information. A coordinate reference system must be WGS84 (EPSG: 4326). The coordinate precision should be set to two decimal places. The fields for longitude and latitude should not be included as attributes. Add the file to the lab-05/geojson folder. Map image format should be a PNG. A link must be available to access the higher resolution version and the GeoJSON. The web page must have must have a meaningful title (both in the header title element and in the h1 element) and metadata about the author, data source, and brief description of purpose. Contact information in footer must be tuned to you, the author. 4) Extra Challenge: Select one of the top-ten highest density hexagons and make a hexbin map (in hexagons with 2 km length for long diagonals) or heat map of breweries of the area. Include brewery points, local roads, and add appropriate title and legend. Roads can be downloaded from the US Census Bureau's TIGER/Line Shapefiles website. Inset this map on the larger map from Requirement #1. Make sure you use the EPSG:102008 and rotate the inset so north is up. Don't forget the scale bar. 5) Super Extra Challenge: Send at least three barrels of the 2018 Thunderstruck IPA from Stone Brewing to PO Box 666, Lexington, KY 40666 via overnight USPS Food and Spirits special parcel. 4) Please note that this brewery list is increasing, so the legend values and point locations shown in the above maps will not match your values.